Please refer to our stock # T 1736 when inquiring. 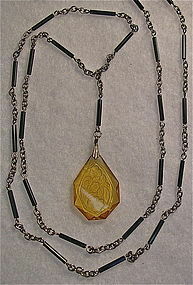 Circa 1920 to Art Deco era 36" long silver tone chain and black glass necklace lavalier sautoir with a 3" pendant or drop of a "Lalique" like finely etched and ground floral berry amber glass drop. Floral berry etched glass drop is 1 3/8" X 7/8" X 6mm thick with nice heft. There are a few books that describe this type of cut work as "Lalique" like. For more info please view images.